I had an amazing opportunity to go on a vacation of a lifetime! I feel like I way this every year, but, this year it truly was! A couple of years back...like 2008 or 2009, Richard Rohlfing promised Jen that he would one day show her around Israel. Fast forward a couple of years and for the last 3 years, my brother has been helping Hume Lake lead trips to Israel with an organization called GTI Tours. So, Jen met up with Richard in January and said he helping lead a trip to Israel with Bridgeway Christian Church with GTI Tours!! Perfect! Sign us up (which is exactly what we did)! 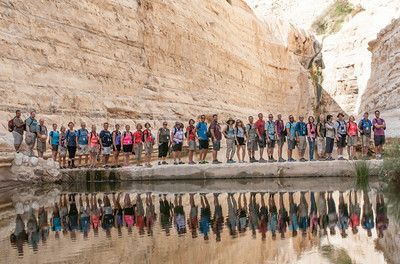 The dates were great for us and so we headed to Israel August 31-September 11, 2015! We arrived two days before Bridgeway and did some sightseeing on our own and then joined up with them. They were jet-lagged, we were not since Israel is in the same time zone as Romania! 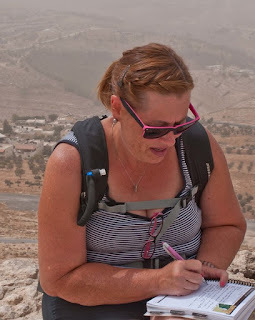 We saw so many great sites, learned so many new things and what they say is true: when you read the Bible it is in black and white....but, when you go to the places in the Bible and experience and see them, they turn from black and white into color! We saw and did so many amazing things: crawled through the Caves of Adullam where David hid after he fought Goliath and was fleeing from Saul, hiked through the Wilderness of Zin, took a boat across the Sea of Galilee, swam in the Dead Sea, walked the Via Dolorosa, rode a camel, waded through Hezekiah's tunnels, prayed in the Garden of Gethsemane and stood in the spot where Jesus was born and the place where he died! Enjoy these highlights of pictures! My first Falafel...and boy was it yummy! Ein Gedi! So refreshing after being so hot at Masada! Mt. Tabor is in the background...ironically we both went to Tabor College! 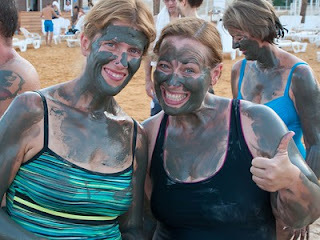 Dead Sea mud is a great facial treatment!! In Hezekiah's Tunnel with new friends!